Creamy Fettuccine with Shrimp and Bacon and the Winner is . . . I have been reading many of your blogs. Now that we are no longer traveling for a while, I have more time to sit at my computer. Since before Thanksgiving we have been gone more than we have been home. In the car, returning from our last trip, I made mental lists of all of the things I want to accomplish in the next 6 weeks. There are many household projects to get done, but spending more time on my blog is one of my goals. As expected, many of the food blogs are showcasing lighter food. It may be New Year’s resolutions to lose weight, but I suspect that it is also that our bodies are merely physically rebeling against all of the overindulgences. Frankly, I just want to eat healthier this year. I plan to spend a lot of time at the Farmers’ Market at Flagler Beach. The Plant City strawberries should be ready for picking soon, if the frost hasn’t damaged the crops too much. I want to find a local source for fresh eggs and fresh meat. I no longer care if a whole chicken is on sale at Food Lion for 69 cents a pound. I would rather pay more for an organic, pesticide free, free range bird. We did attend a Weight Watchers meeting yesterday and I am pleased with the new program that they have put in place. The old Points System they used was based on calories. This resulted in rewarding even bad choices in food if the calories were the same as good choices. For instance a croissant with a pat of butter had the same number of points and calories as a poached egg, 1 slice of whole wheat toast, 3 ounces of protein and a pat of butter. The way Weight Watchers is now calculating the points system is by factoring in protein, fiber, fat, and carbohydrates. Also most fruits and vegetables have 0 points so they become a more important part of the choices that you make. David has been craving more seafood in our diet. so I made this creamy fettuccine with shrimp and bacon the other night. I adapted it from a recipe in Cooking Light magazine. Instead of using cream it calls for light milk thickened with a little flour to give it a creamy consistancy. It goes light on the bacon and adds lots of vegetables to the mix. We enjoyed it and I didn’t feel like I was deprived of a thing. Cook bacon in a large nonstick skillet over medium heat 6 minutes or until crisp. Remove bacon from pan, reserving 1 tablespoon drippings in pan. Crumble bacon and set aside. Add shrimp and garlic to pan, saute over medium-high heat 2 minutes or just until shrimp are done. Transfer shrimp mixture to a large bowl; keep warm. Combine milk, flour, and salt and pepper stirring with a whisk. Add milk mixture to pan; cook over medium heat until thickened and bubbly, stirring constantly with a whisk. Remove pan from heat; add cheese, stirring until blended. Add shrimp mixture back to pan and stir. Add pasta to pan and stir gently to combine. Add a little reserved pasta water if necessary. Sprinkle in parlsley and serve. Serves 4. Now for the drawing of a copy of As Always, Julia. Using Random. Org. the winning number is #15. That would be Barbara of Moveable Feasts. Congratulations Barbara. Email me with your address and I will send you a copy as soon as possible. Thank you everyone for your encouraging comments. It has given me inspiration going into my third year of blogging. The new recipe is very welcome since Don and I are on a plan. The worst problem we have is eating out so much. Trying to reign that in some. Take care. Nice recipe…congratulations, Barbara! I think it will be a good read. The strawberries are very good and they seemed to have survived the frost in Plant City. The tomatoes seem to be the opposite. We planted 1 Roma tomato plant in October and thanks to Lowe’s green frost blanket, it has survived and we have one pink and lots of green tomatoes and blossoms. Welcome back. I’ve been craving more seafood, too, and this dish sounds fabulous. I love the pre-NY seafood sales and I cannot wait for Lent. My husband just told me he could live on shrimp, something I did not realize after 21 years of marriage. I do love Cooking Light. I love the idea of making a creamy fettuccine lighter!!! I also have good intentions to cook healthier. I am now with Cooking Light. I must say this recipe sounds fantastic, all good ingredients and prepared the right way. What a lovely recipe. Sounds fabulous! This recipe looks delicious – shrimp and bacon – interesting, and a I like the idea of making it lighter. This looks like a good Friday-night-staying-by-the-fire dinner. Congratulations to Barbara. We’re craving lighter fare too and Cooking Light always fills the bill. 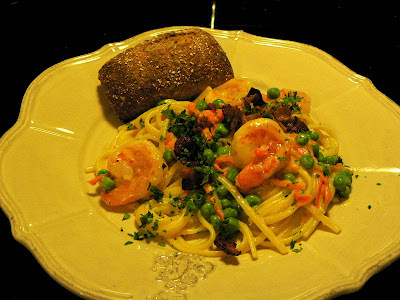 Lovely pasta dish with the shrimp. Congratulations to Barbara! Your shrimp look great! It looks delicious Penny and we need to be eating lighter here as well. Best of luck on the weight issues. food like this will make it a bit easier! That sounds so yumptious! I’m glad to hear what WW has changed and that sounds like it makes more healthy sense. I always enjoy seeing your latest dish! HAPPY ANNIVERSARY!! It’s been wonderful, and I’m looking forward to this Bright New Year! This post was published by Penny on January 6, 2011.